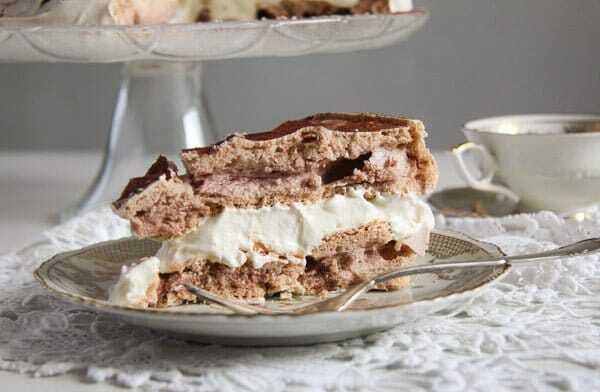 Glorious and decadent Polish meringue cake – Tort bezowy – with a mascarpone and rose water filling. 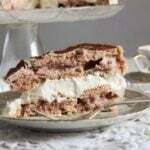 However, I got distracted again, now back to our Meringue Cake with Mascarpone Filling – Polish Bezowy Torte. You so definitely have to try this cake! We had it for the first time on the first day of our holiday in Poland in a little cafe in the little town we where staying. After driving all night to get there, we spent the early morning sleeping in our hotel room, however, as we were only supposed to arrive at about midday we were not registered for breakfast. So, when we woke up at about 10 o’clock, we went out to take a walk and to look for something to eat. As it was not lunch time yet, we could not find any restaurant already serving lunch, so we entered this little cafe thinking about coffee and some rolls or something. Well, the kids spotted the gofry or waffles and had that for breakfast and I spotted this huge and amazing looking meringue cake or bezowy tart. Great breakfast, isn’t it? I wrote down the name of the cake and as soon as we got back to the hotel I started looking for a recipe. Well, I was not very lucky there, I could not find one recipe in English, Romanian or German that would look anything like the cake I had just eaten. So I had to recreate that myself. Well, it was not that difficult, it was pretty easy to recognize the meringue, I just had some difficulties with the filling. 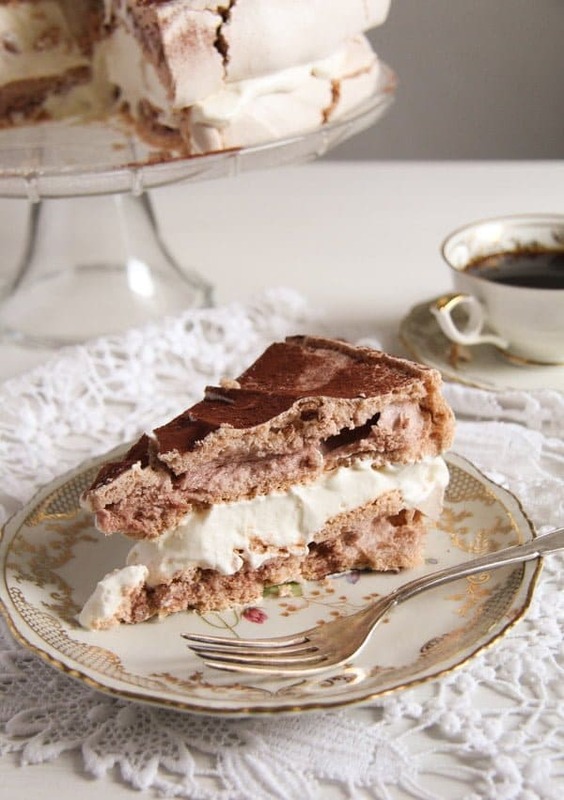 A Polish friend helped me with the translation of some Polish recipes for the bezowy cake, so I knew that the main ingredients for the filling were mascarpone and smetana (or a stiffer crème fraiche, if you cannot find smetana). I added some rose water because I love the Polish rose petal jam and it was a perfect fit, I must say, that light rose flavor compliments so well the sweetness and crispiness of the meringue and the freshness and creaminess of the filling! The perfect cake, I am telling you! How to make basic meringue? Well, it could not be any easier! And what a delicious way of dealing with all those leftover egg whites that I always seem to have in my fridge and freezer. 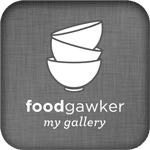 By the way, egg whites keep in a closed jar in the fridge for up to two weeks and I think that I have egg whites in my freezer that are more than one year old. I used them for meringues often enough and the meringues came out well every time. Make sure that the bowl and the mixing whiskers you are using are very clean. And also that the egg whites are totally free of egg yolk residues as well. If there is any trace of fat on the bowl or of egg yolk in the egg whites, you will not be able to get any meringue at all. Making meringue takes a bit of time, so do yourself a favor and make the meringue in a kitchen machine. You could do it with a hand held mixer as well, but it will take forever… A strong kitchen machine is almost a must! Add some stabilizer to the egg white mixture. Some people use cream of tartar, but I have had very good results with cornflour, so I am using that now all the time, instead of buying cream of tartar just for this purpose. Also, add a bit of apple or white wine vinegar. It also helps stabilize the meringue and used in such small quantities will not influence the taste. The stabilizers will help the meringue hold its shape better, so it will have nicer edges and peaks when baked. For today’s Meringue Cake with Mascarpone Filling – Polish Bezowy Torte I used a method I found in Nigella Lawson’s cookbook How to Eat. The method is simple and it always yealds great results, giving you a meringue that is crispy on the outside and slightly soft on the inside, just the way it was in Poland. So, preheat the oven to 180 degrees Celsius/ 360 degrees Fahrenheit. Make the meringue, give it onto the lined baking tray, place it in the oven and immediately turn the heat down to 150 degrees Celsius/ 300 degrees Fahrenheit. Bake the meringue for 1 ¼ hours, turn off the oven and leave the meringue inside until cooled completely. That is why I make the meringue one day in advance, so I don’t have to stress about it being cool in time. 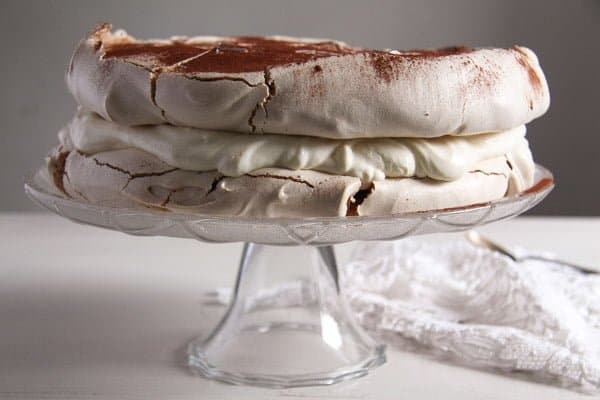 And one more word: this recipe makes quite a large cake, the meringue expands while it bakes, so the cake will probably be larger than you expect it to be. If baking for a smaller party, you could halve the recipe. 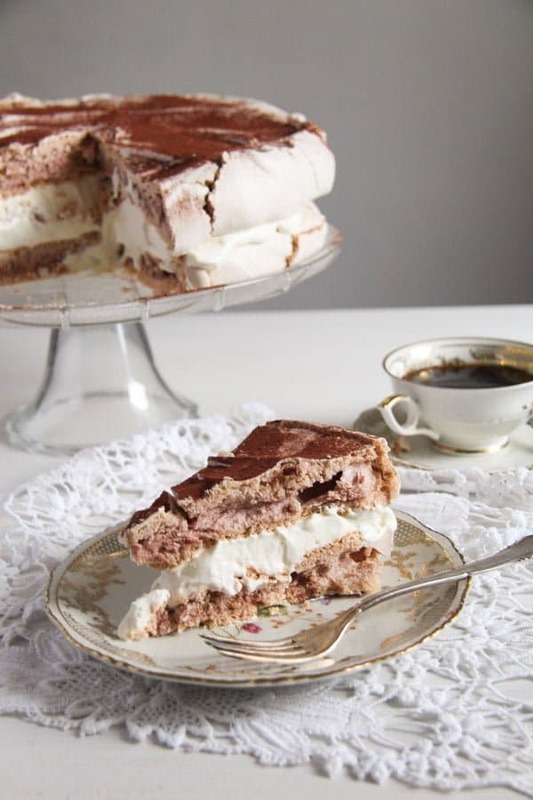 So, now that you know how easy it is to make meringue, do give this Meringue Cake with Mascarpone Filling – Polish Bezowy Torte a try, you will love it! Preheat the oven to 180 degrees Celsius/ 360 degrees Fahrenheit. I use the convection oven for making meringue, because this allows me to bake both trays with meringue at the same time. Line two baking trays with baking paper. Make sure that the mixing bowl and the mixing whiskers of the kitchen machine are very clean. Give the egg whites to the mixing bowl. Add the salt and start beating them until silky peaks form. Slowly, start beating in the sugar, about a third at a time, whisking very well in between, it will take about 10 minutes. Sprinkle the cornflour and unsweetened cocoa powder on top of the egg whites. Add the vinegar as well. Continue beating for another minute. Divide the mixture and mound it onto the prepared baking trays. Form two circles of about 20 cm/ 8 inches and keep in mind that the meringues will expand in the oven, so the cake will be rather large. Place the baking trays in the oven and IMMEDIATELY turn down the heat to 180 degrees Celsius/ 360 degrees Fahrenheit. Bake the meringues for 1 ¼ hours. Turn off the oven and leave the meringues inside the hot oven until they are completely cool. It is better to make them a day ahead, so that you will not stress about them not being cool in time to serve. 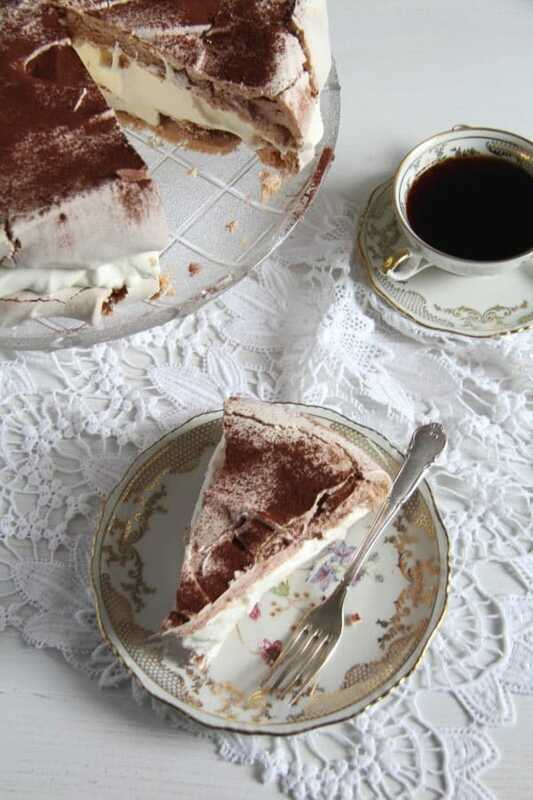 Give the mascarpone, smetana or crème fraiche, icing sugar and rose water to taste into a bowl. Mix very shortly to get the mixture smooth, but do not over mix, I find that if I mix mascarpone too long it becomes runny. according to the packet's instructions, that is beat the heavy creamy shortly, then slowly give the stabilizer to the cream while beating all the time until the cream has the desired consistency. Carefully fold the heavy cream into the mascarpone mixture. Add 1 to 3 tablespoons lemon juice to taste. Place one meringue onto a serving cake platter. Cover with the filling, add the second meringue on top, press slightly and sprinkle some unsweetened cocoa powder on top. Keep refrigerated until ready to serve. The bezowy cake has the best consistency when eaten on the day you put it together, but the leftovers are still delicious the next day. Keep in mind that the egg whites will expand in the oven, so the cake will be quite large. Halve the quantities if you wish to make a smaller cake.When making the filling with smetana I would use 2 packets. Crème fraiche is sometimes less stiff than smetana, so I would use 2 ½ or 3 packets Dr. Oetker cream stabilizer. Oh gosh, meringue is my absolute favorite! Light and decadent all at the same time. Love the look of this cake, Adina! It looks amazing. I have to admit, I’m one of those people that say it would be too sweet for them, I mean it though. I only eat dark chocolate as even milk chocolate is a bit too sweet. But I do like the look of it. I will make it for you when you come to visit, Anca. 🙂 I think you will love it despite it being it so sweet. Well, the filling is quite refreshing and not very sweet, so the cake is quite balanced. i don’t make a lot of meringue desserts, but they sure are elegant and pretty! love the filling in this one!